Auditors are responsible for performing financial and risk management audits and independent audits for commercial and public sector organizations. 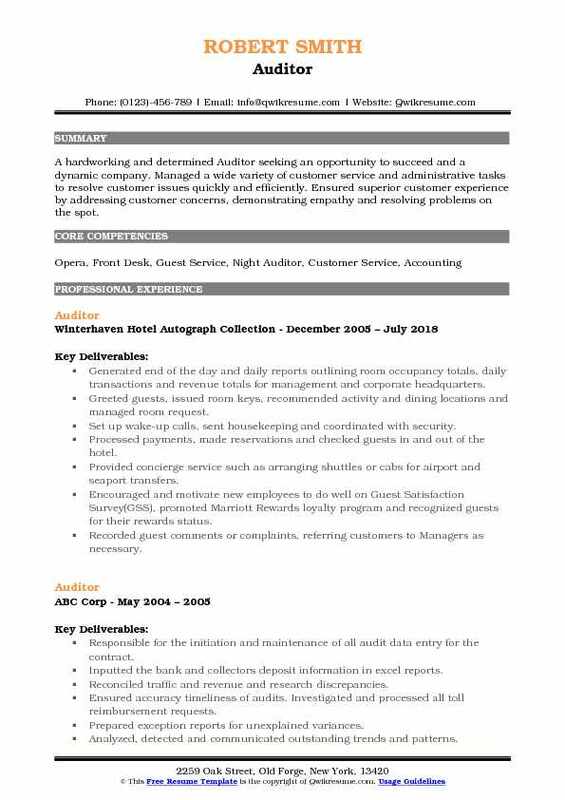 Key activities included in the Auditor Resume are – collating, checking and analysing spreadsheet data, gauging levels of financial risks, checking accuracy of financial reports and records, ensuring safety of assets, preparing reports of financial statements; ensuring procedures, policies, and legislation and regulations are complied with; and examining financial control systems and company accounts. Key skills expected from Auditors include – the ability to detect and identify financial issues, a strong aptitude for maths, a keen interest in financial systems, and the ability to work under deadlines, strong IT skills, and a good knowledge of basic accounting, and strong grasp over both internal and external audits. A Bachelor’s degree along with a Chartered Institute of Public Finance and Accountancy qualification is needed to work as an Auditor. Headline : Night Auditor who has held multiple positions where financial mathematics, hospitality, general bookkeeping and accounts payable/ receivable have been the mainstay. Excellent financial document review and data management skills coupled with an eye for accurate reporting. 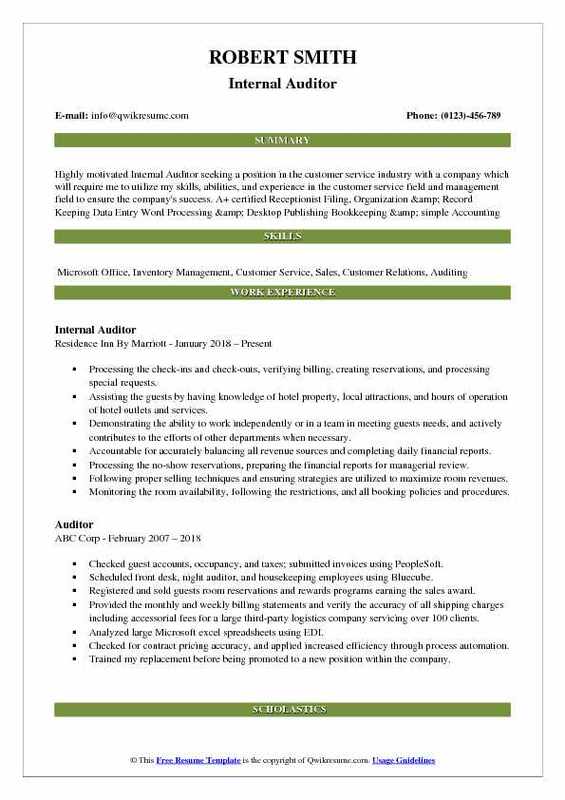 Additional skills and knowledge include the following: Microsoft Excel, Auditing, Account Reconciliations, Invoice Processing, Accuracy in Detail, Cash Management. Performing a variety of front desk and night audit-related duties such as answering the phones, making/changing reservations, answering questions. Efficiently using the hotel reservation and check-in/check-out software. Checking guests in and out of the hotel with software used by mount pleasant inn and suites. Setting-up guests wake-up calls in an automated system and making sure guests received them. Running nightly reports that were used by the general manager and the corporate office. Helping the guests who have complaints or questions, resolving complaints, assisting the guests in escalating their complaints to higher management. Correcting any mistakes made throughout the day as well as balancing all credit card transactions nightly. Rendering the audit conclusions, preparing the audit work papers and reports to be presented to management. 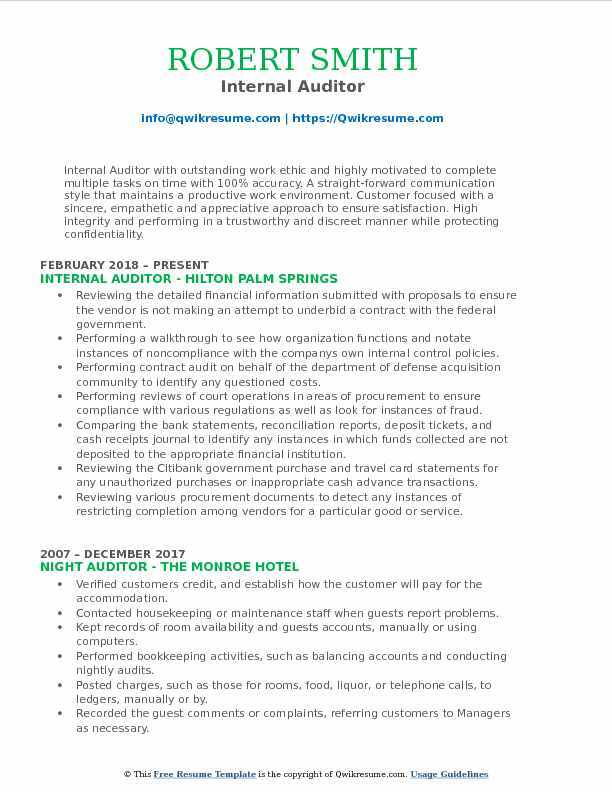 Summary : Friendly and enthusiastic Auditor I with over eleven years of experience in the Hospitality domain. Able to learn new tasks quickly and proficient in growing key customer relationships. Represent establishment with friendly, professional demeanor at all times. Able to learn new tasks quickly and also proficient in growing key customer relationships while representing the company with a friendly and professional demeanor at all times. Ran daily, weekly and monthly reports to close day and meet objectives. Trained and mentored staff on procedures, service standards and productivity. Checked hotel guests in and out in a professional and friendly manner. Supervised front desk operations to ensure that all guests received superior. Efficiently resolved guest complaints and ensured that issues were addressed. Handled all duties and tasks for the night manager and concierge when those. Investigated auditing discrepancies by reconciling cash drop and credit card. Compiled, printed and distributed the daily reports to include the closing balance, guest folio, departing guest reports, room occupancy. Processing the check-ins and check-outs, verifying billing, creating reservations, and processing special requests. Assisting the guests by having knowledge of hotel property, local attractions, and hours of operation of hotel outlets and services. Demonstrating the ability to work independently or in a team in meeting guests needs, and actively contributes to the efforts of other departments when necessary. Accountable for accurately balancing all revenue sources and completing daily financial reports. Processing the no-show reservations, preparing the financial reports for managerial review. Following proper selling techniques and ensuring strategies are utilized to maximize room revenues. Monitoring the room availability, following the restrictions, and all booking policies and procedures. After completing financial tasks, working on assigned additional projects, stocking supplies. 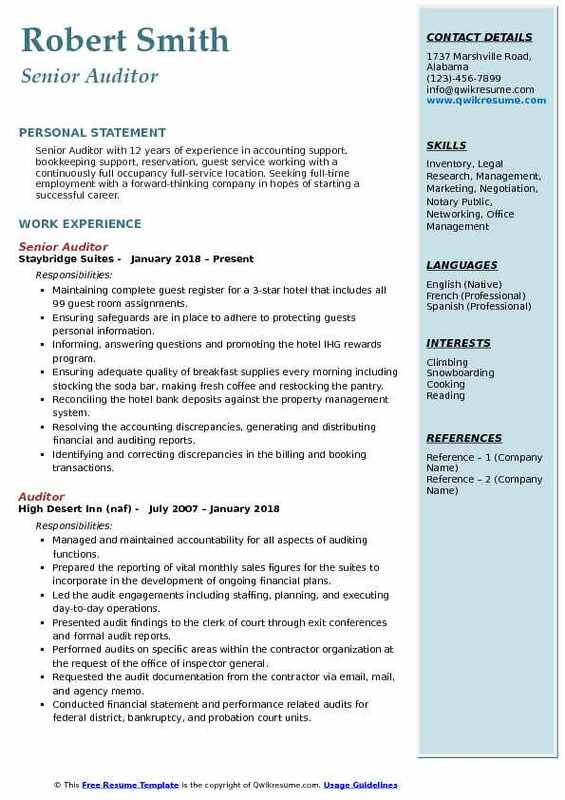 Headline : Motivated, personable, focused and dedicated Auditor with 6 years of expeirnece in the Hospitality domain and with a great eye for detail. Strong interpersonal and communication skills. Dynamic and focused leadership capabilities. Ability and desire to work in a team- based setting. Diplomatic and tactful with professionals and non-professionals at all levels. Accustomed to handling sensitive, confidential information. Excellent team building skills. Verifying that room rates are correct and posting those rates to guest accounts. Monitoring the current status of the coupon, discount, and other promotional programs. 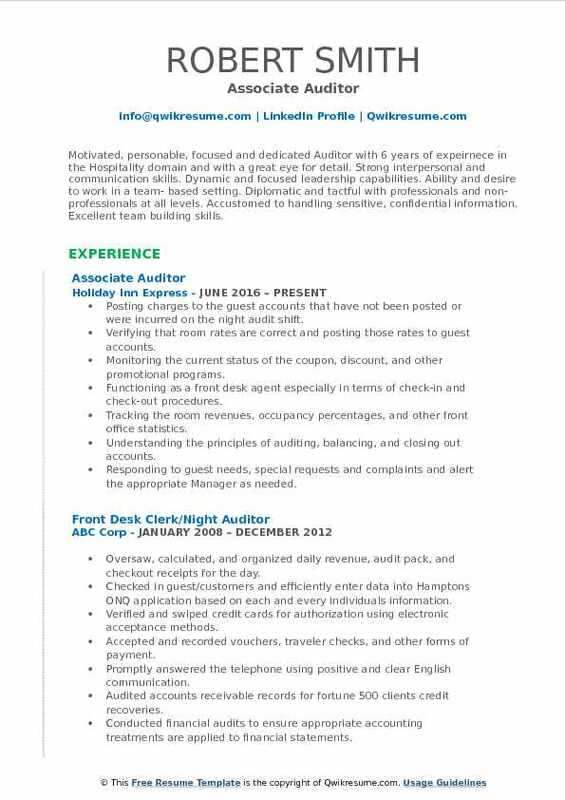 Functioning as a front desk agent especially in terms of check-in and check-out procedures. Tracking the room revenues, occupancy percentages, and other front office statistics. Understanding the principles of auditing, balancing, and closing out accounts. Responding to guest needs, special requests and complaints and alert the appropriate Manager as needed. Performing nightly balancing of in-room video and long-distance telephone services. Preparing and analyzing the audit reports. Developing results with recommendations for improving the procedures being audited. 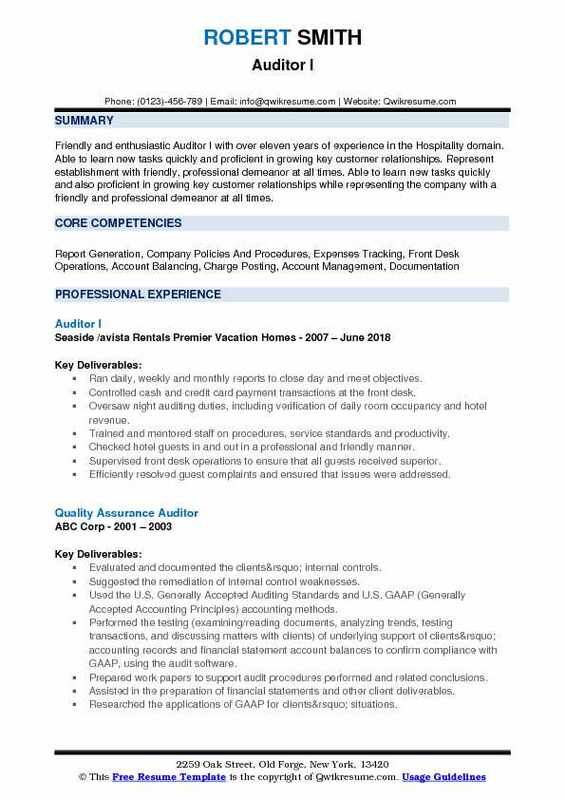 Summary : Senior Auditor with 12 years of experience in accounting support, bookkeeping support, reservation, guest service working with a continuously full occupancy full-service location. 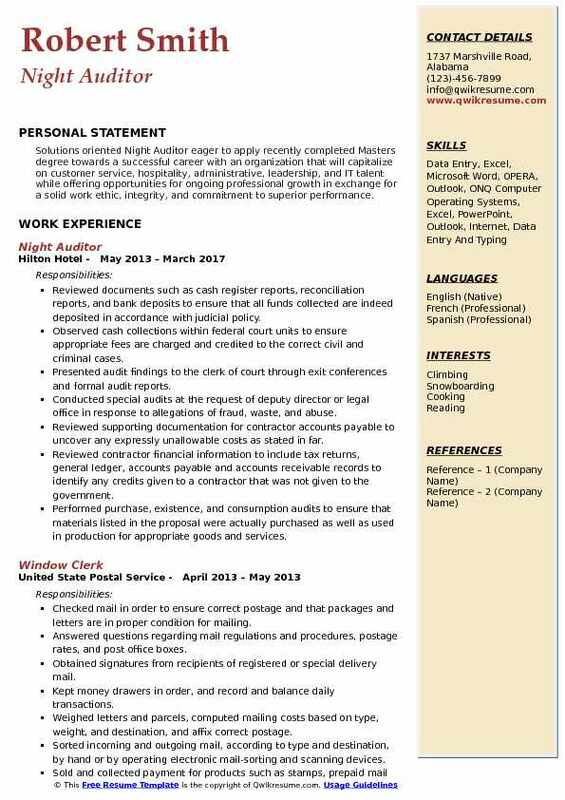 Seeking full-time employment with a forward-thinking company in hopes of starting a successful career. Maintaining complete guest register for a 3-star hotel that includes all 99 guest room assignments. Ensuring safeguards are in place to adhere to protecting guests personal information. Informing, answering questions and promoting the hotel IHG rewards program. Ensuring adequate quality of breakfast supplies every morning including stocking the soda bar, making fresh coffee and restocking the pantry. Reconciling the hotel bank deposits against the property management system. Resolving the accounting discrepancies, generating and distributing financial and auditing reports. Identifying and correcting discrepancies in the billing and booking transactions. Supporting the accounting department in tracking financial data and accurately processing payments. Responsible for daily earning reports, processing of credit cards, balancing and auditing fiscal inventory and completed "new day" procedures. 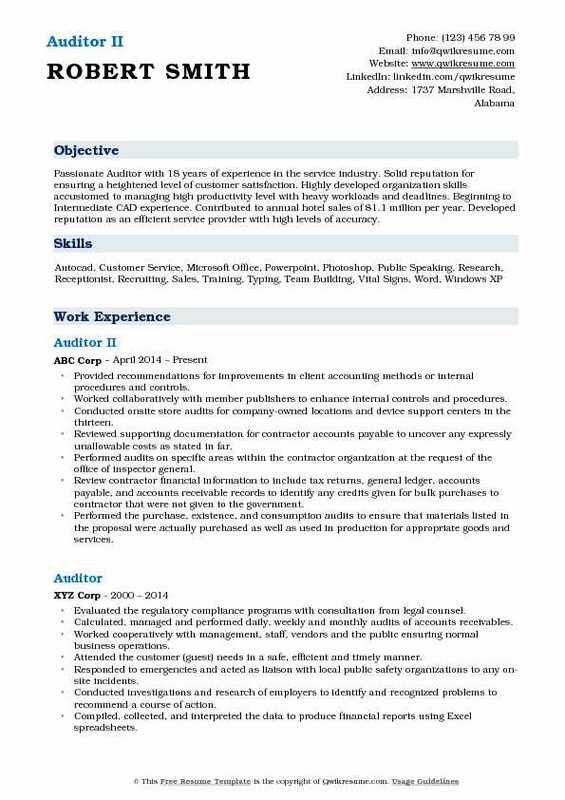 Summary : Passionate Auditor with 18 years of experience in the service industry. Solid reputation for ensuring a heightened level of customer satisfaction. Highly developed organization skills accustomed to managing high productivity level with heavy workloads and deadlines. Beginning to Intermediate CAD experience. Contributed to annual hotel sales of $1.1 million per year. Developed reputation as an efficient service provider with high levels of accuracy. Provided recommendations for improvements in client accounting methods or internal procedures and controls. Worked collaboratively with member publishers to enhance internal controls and procedures. Conducted onsite store audits for company-owned locations and device support centers in the thirteen. Reviewed supporting documentation for contractor accounts payable to uncover any expressly unallowable costs as stated in far. Performed audits on specific areas within the contractor organization at the request of the office of inspector general. Review contractor financial information to include tax returns, general ledger, accounts payable, and accounts receivable records to identify any credits given for bulk purchases to contractor that were not given to the government. Performed the purchase, existence, and consumption audits to ensure that materials listed in the proposal were actually purchased as well as used in production for appropriate goods and services. Reviewed fixed price and cost type contracts simultaneously for a contractor to identify any instances or attempts at cost shifting from one contract/task order to another. Summary : Internal Auditor with outstanding work ethic and highly motivated to complete multiple tasks on time with 100% accuracy. A straight-forward communication style that maintains a productive work environment. Customer focused with a sincere, empathetic and appreciative approach to ensure satisfaction. High integrity and performing in a trustworthy and discreet manner while protecting confidentiality. Reviewing the detailed financial information submitted with proposals to ensure the vendor is not making an attempt to underbid a contract with the federal government. Performing a walkthrough to see how organization functions and notate instances of noncompliance with the company's own internal control policies. Performing contract audit on behalf of the department of defense acquisition community to identify any questioned costs. Performing reviews of court operations in areas of procurement to ensure compliance with various regulations as well as look for instances of fraud. Comparing the bank statements, reconciliation reports, deposit tickets, and cash receipts journal to identify any instances in which funds collected are not deposited to the appropriate financial institution. Reviewing the Citibank government purchase and travel card statements for any unauthorized purchases or inappropriate cash advance transactions. Reviewing various procurement documents to detect any instances of restricting completion among vendors for a particular good or service. 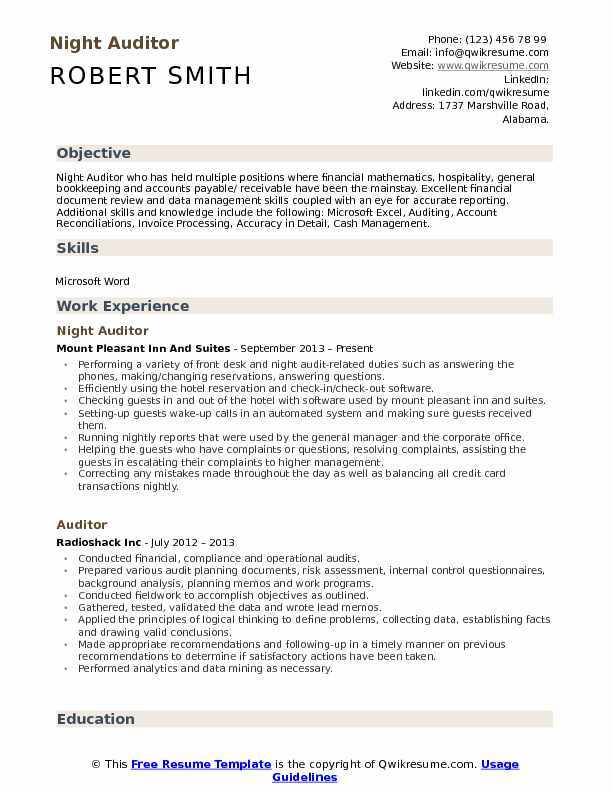 Summary : A hardworking and determined Auditor seeking an opportunity to succeed and a dynamic company. Managed a wide variety of customer service and administrative tasks to resolve customer issues quickly and efficiently. Ensured superior customer experience by addressing customer concerns, demonstrating empathy and resolving problems on the spot. Generated end of the day and daily reports outlining room occupancy totals, daily transactions and revenue totals for management and corporate headquarters. Greeted guests, issued room keys, recommended activity and dining locations and managed room request. Set up wake-up calls, sent housekeeping and coordinated with security. Processed payments, made reservations and checked guests in and out of the hotel. Provided concierge service such as arranging shuttles or cabs for airport and seaport transfers. Encouraged and motivate new employees to do well on Guest Satisfaction Survey(GSS), promoted Marriott Rewards loyalty program and recognized guests for their rewards status. Recorded guest comments or complaints, referring customers to Managers as necessary. Performed financial examinations to ensure entity is adhering to Federal Acquisition Regulations (FAR). Objective : Solutions oriented Night Auditor eager to apply recently completed Masters degree towards a successful career with an organization that will capitalize on customer service, hospitality, administrative, leadership, and IT talent while offering opportunities for ongoing professional growth in exchange for a solid work ethic, integrity, and commitment to superior performance. Reviewed documents such as cash register reports, reconciliation reports, and bank deposits to ensure that all funds collected are indeed deposited in accordance with judicial policy. Observed cash collections within federal court units to ensure appropriate fees are charged and credited to the correct civil and criminal cases. Presented audit findings to the clerk of court through exit conferences and formal audit reports. Conducted special audits at the request of deputy director or legal office in response to allegations of fraud, waste, and abuse. Reviewed contractor financial information to include tax returns, general ledger, accounts payable and accounts receivable records to identify any credits given to a contractor that was not given to the government. Performed purchase, existence, and consumption audits to ensure that materials listed in the proposal were actually purchased as well as used in production for appropriate goods and services. 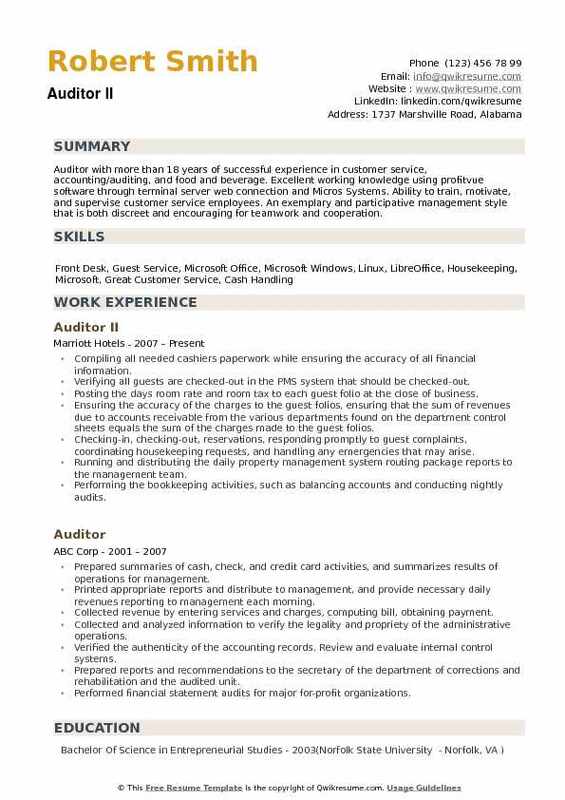 Summary : Auditor with more than 18 years of successful experience in customer service, accounting/auditing, and food and beverage. Excellent working knowledge using profitvue software through terminal server web connection and Micros Systems. Ability to train, motivate, and supervise customer service employees. An exemplary and participative management style that is both discreet and encouraging for teamwork and cooperation. Compiling all needed cashiers paperwork while ensuring the accuracy of all financial information. Verifying all guests are checked-out in the PMS system that should be checked-out. Posting the days room rate and room tax to each guest folio at the close of business. Ensuring the accuracy of the charges to the guest folios, ensuring that the sum of revenues due to accounts receivable from the various departments found on the department control sheets equals the sum of the charges made to the guest folios. Checking-in, checking-out, reservations, responding promptly to guest complaints, coordinating housekeeping requests, and handling any emergencies that may arise. Running and distributing the daily property management system routing package reports to the management team. Performing the bookkeeping activities, such as balancing accounts and conducting nightly audits. Posting charges, such as those for rooms, food, liquor, or telephone calls, to ledgers, manually or by.